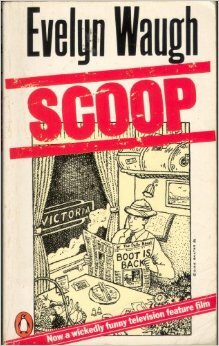 This special podcast scripts recap from Why I Really like This Book, is on Scoop, Evelyn Waugh’s magnificent satire about newspaper journalism. 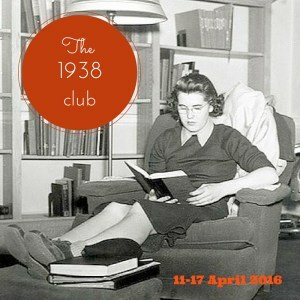 Scoop is also a member of The 1938 Club, a week of book reviews and blog posts about the reading of 1938, that’s taking place between 11 and 17 April 2016. British journalism changed radically at the beginning of the 20th century, with an increasing population growing in literacy and demanding more and more newspapers to read. The practices of gathering news, and what you did with it, also changed, which is what the pointedly satirical Scoop is all about. Evelyn Waugh is a byword in English literature for being rude and offensive, and as the author of the utterly nostalgic Brideshead Revisited, and of the Sword of Honour trilogy, which is so bitter about the experience of trying to be a soldier in the Second World War that reading it can be a very depressing experience. Before the war, Waugh was less bitter, and less despondent, and more fun, while still being terminally exasperated with the stupidity of almost everyone. This jaundiced view of life, and humanity, is easier to enjoy when it is still relatively positive. In Scoop, his hero, William Boot, is a thoroughly admirable and decent chap, and nothing bad happens to him. Had Scoop been written 15 years later, Boot would have suffered far more than he gets away with in the relatively innocent and optimistic 1930s. And as I enjoy a novel so much more when the lead protagonist is not made to have a ghastly time, I really enjoy Scoop. It’s a story of decent values triumphing over the false gods of media megalomania and dishonesty, and the pursuit of truth as opposed to the invention of false news. 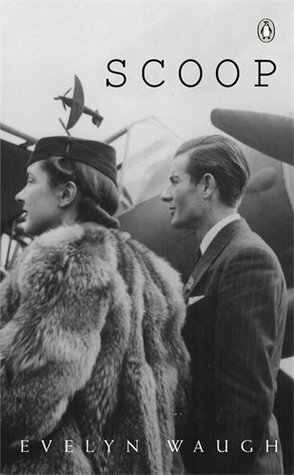 But set beside these admirable, up-beat, positive values, there is the inescapable fact that Waugh wrote about people who were not white, or western European, in a way that we cannot tolerate in writers of today. Here comes my mini-lecture on anachronism, and racism in fiction: if a novel was written before the age of political correctness, which means the 1980s, we have to ignore words and sentiments that we categorise as racist today, and that includes the names given to black people. If the novel was published before the Second World War, we also have to remind ourselves that Jews were routinely referred to then in ways we could not possibly use today, because then the Holocaust had not happened, and casual, unthinking anti-Semitism was simply a part of how Europeans and Americans thought and expressed themselves. If we insist on applying the social and political views of today onto the novels written in a past epoch, we’re just making arguments where there aren’t any. Not all authors of the 1920s and 1930s were racist. If the more sensitive, intelligent and politically advanced authors who had actually thought about offensiveness, and stereotyping, and the damage some words do, wanted their characters, contemporary to their own time, to sound normal and authentic, they used the words we don’t use today, but in the dialogue of the characters. They kept the narrative voice away from the dubious language. Evelyn Waugh does not do this: his narrative voice in Scoop does use the words we don’t use now, and we just have to accept it. If this affects your enjoyment of the novel, well, I’m sorry about that. It’s a pity, because it is possible to have politically acceptable beliefs now and still enjoy fiction that ignores that kind of thinking. In Scoop, which is largely set in Ishmaelia, an invented north African country, there is plenty of scope for Waugh to be offensive and unpleasant, but, cleverly, he is mostly offensive for a good reason: to show up the stupidity and greed of almost all the characters, black and white. And at that point I’m going to stop excusing him and just tell you why this novel is good. First, it contains a great portrait of a megalomaniac newspaper proprietor, Lord Copper, who appears to have no news sense at all, but a good strong feeling about what will sell. His underlings are so terrified of him that good news stories suffocate in the underlings’ quite understandable desire not to be sacked. Second, most of the novel is a superb extended satire on how journalists create and suppress the news, what they think news is, and how they fight to get on top of or ahead of each other. Fiddling expenses is a large part of this. Thirdly, Waugh creates spectacularly funny characters. Mrs Stitch is a society lady and political wife of great influence. Her opening scene, in which she is encountered sitting in bed in a face mask, speaking on the telephone, while simultaneously dealing with her secretary, daughter, visitor and maid, having five different conversations at once, is just the wittiest piece of dialogue. She drives a tiny black car that is small enough to nip up the kerb and onto the pavement whenever she thinks she has waited too long in a traffic jam. Later in the book she spots someone she’s been meaning to speak to for weeks, and follows him into the public lavatory, in her car, down the steps, and gets stuck there. The world needs more characters like Mrs Stitch. Her purpose in the novel is to wield influence that goes absolutely nowhere because she doesn’t explain quite enough about the person she wishes to gain a favour for, and so someone else gets the favour instead, whom she doesn’t know and never will know. Thus there is a pretty strong attack in Scoop on how influence is wielded by the wrong people for the wrong reasons, with futile results. Jumping back to the journalists, they’re working in a world where sending a foreign correspondent to Ishmaelia will take three weeks. Filing copy is done by post that also takes three, or more, weeks, and urgent news stories are despatched by telegram. The telephone doesn’t seem to be involved, and if the telegram office is shut, or closed by the government on whom you wish to report, well, the story just has to sit there and wait. Waugh has a fun time inventing messages in mad telegraphese, which William Boot, and the reader, isbemused by, and needs to translate. His own telegrams are very expensive, because he writes them as a polite social letter, with wordy self-deprecating English politeness. There are a nice collection of journalist types: the French are a joke, the professional American writer is derided, and the professional Big Cheese journalist is so arrogant about his nose for news that he leaves Ishmaelia just before the biggest news story of the decade erupts there. The British reporter is caricatured as a tale-bearer with rights, and his news-gathering habits are robustly despised. In a fragment of long-lost period detail, film crews on the hunt for news to make their cinema newsreels are far too fond of dressing the part. But above all this, the international press are depicted, unlovingly, as an invading imperialist force with no more interest in or respect for the non-white nations than the British Empire. The local Ishmaelites, on the other hand, may have a more direct understanding of how to get money out the whites, than the whites might like, but Waugh does enjoy himself characterising the whites as very easily diddled. The white journalists don’t stay long enough in a country to learn anything about it, and treat all foreigners as the same. 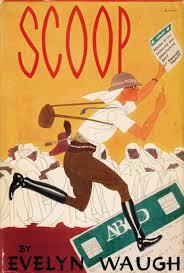 Compared to Waugh’s far less jolly travelogue Remote People (1930), Scoop is a riot of pleasantness and the love of human frailties. It’s certainly one of Waugh’s least uncomfortable novels, though the prickles are there. For other 1938 novels that I happen to have blogged about in the past, see This Publican by Dornford Yates, and Artists in Crime by Ngaio Marsh. Later this week I’ll return to the mini-series on political fiction, coincidentally a work from 1937, George Orwell’s The Road to Wigan Pier. I know it’s not a novel, but it’s an excellent, political, contrast to the fiction of 1938. What a good idea this 1938 big read is. Not least because Angela Thirkell’s Pomfret Towers qualifies for it, so readers may discover an author they have never heard of. Scoop is funnier each time you read it; and not a year goes past but what I say “Up to a point, Lord Copper” which is the minion’s strongest expression of disagreement! I also say “Up to a point, Lord Copper.” Most useful sentence.